it's my girls' world: What's Up Wednesday- March 2017! What's Up Wednesday- March 2017! I love the warmer weather-- even Wednesdays seem better! Spring last year--- Bring on the warmer weather and the longer walks. It's coming though-- this was last Friday! Sometime D works from home on Tuesday. We were able to get some time together and we walked to lunch at a local restaurant. It was such an unexpected little treat. Fish tacos for the win. Oh and I'm loving beets these days after sampling a salad with feta and herbs-- I'll see if I can try to concoct something. I need to do my Spring cleaning and purge of the girls' closet- I'm looking forward to it and dreading it all at the same time. What we've been up to? Working on the green in the house--- I've switched up a couple pieces hoping that different light will be good for the different plants. I've repotted and potted a couple also. Oh and we've been selling the World's Finest Chocolates for C's school-- They are literally called the World's Finest Chocolates. We're working on some lighting for some house and we met with a lighting specialist yesterday--- please, please mister come back with some good options and prices. Is anyone else sad that This is Us is done. I'm still into Grey's and Scandal (though it's super dark this year) and some DWTS when the TV is on. Other than that, tax season has me so busy so I'm really not doing a whole lot more. I am however reading First Women. Podcasts and Google Play-- and then ensuing dance parties follow... to G-play, not podcasts. We aren't that weird. My spring jacket, leggings, cloth scarves and thinner tunics. #momuniform. What I'm doing this weekend? A pretty low key one. A possible play-date, maybe daddy daughter cooking, a meal out and errands. 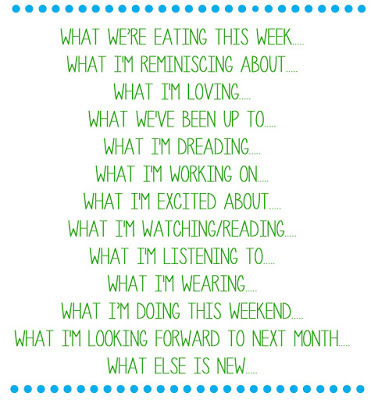 What are you looking forward to next month? We have a daughter turning eight! So party time! My parents are also coming to visit and then we have an Easter Trip to Blue Mountain. Well tax season ends but work will still be there- the pace will be less frantic though. What's my favourite spring pieces? Give me all the cloth scarves! Especially the ones with fun detail and textures. Spring is coming and I think we are all OH so ready for it for sure. That surprise lunch sounds amazing. I love when things like that happen. Good luck with the closets, that is always one of my least favorite things to do. Ooh, I need to start wearing my springy scarves! I've added in a couple of new plants in the house and I love them. Hopefully I can keep these ones alive. And I would pay big bucks to have a good fish taco right now... yum! Those fish tacos look amazing!! Hoping your season slows down!! God bless you, I could never be in the tax field, numbers are my jive lol!!! I want to see you dance to the podcast...lol. Those fish tacos looks so good! And I bought beets this past weekend and am hoping to try a recipe soon. I'm SO sad This Is Us is over :( Such a great show that has me bawling each and every episode (except strangely not the finale). Lots of fun stuff you guys have coming up. 8 years old, such a big girl! NYC Trip- A blizzard, a brother and more.